With four major religions and more than 25 public holidays annually, Sri Lanka has mastered the art of colourful, entertaining and tourist-worthy festivals. While most celebrations are religious in nature, all are welcome to partake. Whether you are looking to expand your cultural knowledge or experience a different religion, here is our rundown of the Sri Lankan festivals you must see. Poya days, or full moon days, are often public holidays in Sri Lanka, while also holding special Buddhist significance. While devout Buddhists traditionally perform religious observances on these days, less pious Sri Lankans mark poya days with parades and drinking. One of the island’s biggest festivals, this poya marks the date of Buddha’s announcement of his impending death, at age 80. This is most widely celebrated with a huge parade at the Gengaramaya temple in Colombo. This parade (known as a perahera in Sri Lanka) typically features a procession of 50 elephants. The most important Buddhist poya, Vesak marks the simultaneous celebration of Buddha’s birth, enlightenment and death. While the holiday is observed by strict Buddhists by meditations and fasts, around the country there are decorations and celebrations. Free food is distributed in the streets. While the sale of alcohol is technically forbidden during many poya festivals, many hotels and guesthouses do not follow this rule. These colourful festivals rival Buddhist celebrations in scale and decoration. Often celebrating specific gods, Hindu celebrations also change dates year over year and often include large processions through the streets. Fire dancers, torch bearers and adorned elephants characterise this 14-day festival. 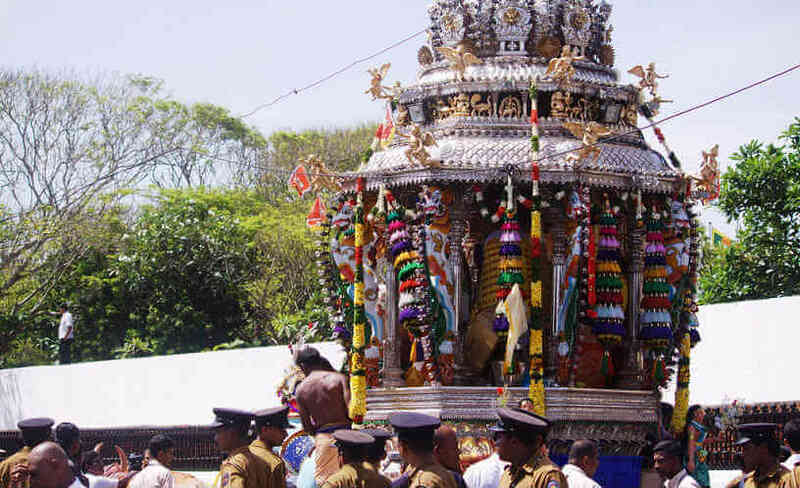 This Hindu festival celebrates the God Skanda – a six-headed, twelve-handed warrior who rides a peacock and often takes place in the jungle shrine called, fittingly, Kataragama. Acts of fire walking and ritual self-mutilation -- such as driving skewers through cheeks and tongues – are common sights. The most important Hindu festival in the capital city of Colombo, Vel celebrates the victory of Sri Murugan, the Hindu god of war. Often an elaborate procession crosses the city carrying the god’s chariot and spear (vel). The Sri Lankan Hindu festival of lights, akin to India’s Diwali celebrations, commemorates the return of the religious hero Rama and the symbolic triumph of good over evil. Tamil households light lamps and wear new clothes in this celebration. The Sri Lankan Muslim community is relatively isolated from other ethnic groups, so their celebrations do not take place on as grand of a scale. The holiday marking the end of Ramadan – the month of fasting and pious religious observance in Islamic tradition – this festival is marked as public holiday in the country. Often festivals are family-oriented events with food and religious observance. Christian festivals are often smaller and less flashy that other religious festivals in the country, but certain areas celebrate on a grand scale. This holiday, which commemorates the crucifixion of Jesus Christ, marks the end of Lent and precedes Easter Sunday. A renowned passion play takes place yearly on the island of Duwa, near Negombo. Though religious celebrations comprise the majority of Sri Lankan festivals, they do have some secular celebrations, as well. On the day of Sri Lanka’s independence, citizens celebrate with large parades, dances and games. A week-long flying festival in Colombo sees tons of hot air balloons flying over the country. This is the perfect opportunity for tourists to experience an extended aerial view of the country. The colourful and exuberant festivals of Sri Lanka are something everyone must experience in their lifetime. But remember to stay safe. Foreign languages, food and customs can leave you vulnerable to trouble. Stay safe with a travel insurance policy from Cover-More Travel Insurance and enjoy the festivals with ease.